Labo Car Designer (4-8yrs), by Labo Lado Inc, is a wonderful exploratory play app geared for children ages 4-8. This app is all about unleashing the creativity and getting the creative juices flowing with a wide array of options. 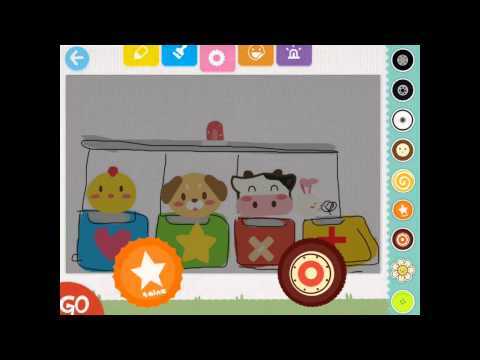 The tykes we field-tested this app with, loved, loved, loved it and returned to Labo Car Designer over and over again! They literally couldn't get enough. Kids can design and draw, customize and decorate, their own vehicle and then drive it through all different terrain. The app gives the option to use a template or go freehand. What we loved most was the option to change from day to night, or from sunny, rain, or snow. We try very hard to stay away from generalizing about gender, but this app does scream boy. That's not to say your little girl won't enjoy it, we just hope they aren't fighting over one iPad to play this game. This is one of the best and fun pre-writing and problem solving apps….I just love it!